Do You Know Michael Ebbs? Found this on Borough high street, Southwark, London…anyone? Posted in Misc and tagged We Don't Normlly Do This at 12:50 pm on August 30, 2015 by Broadsheet. It has expired (4b) – throw it in the bin. 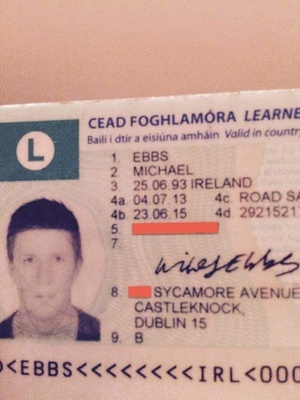 Might still be useful to him as ID, he didn’t cease to be himself on June 23rd! Try saying that to Ryanair when trying to board on an expired passport. maybe a friend borrowed it to get into a niteclub. Just post it to him for feck sake! Post it to him, the friggin address is on the card! Jesus, the world is beating witness to the most infantile generation ever. Use your common sense. No. But thanks for the tip. Donal & Jason, thanks so much for that helpful advice, it’s great to have people like you around checking up on things. Thanks again for your advice, the world is all the richer for your positive, life-affirming attitudes. Goes by the name ‘Wiley Ebbs’ it seems. They don’t teach the children how to write any more. ‘Tis an awful pity, really. Esteban, no need to be rude to the other posters just because you’re not very good at posting things. I’d be furious if it was my face and street you plastered all over social media.